A 1000 pieces jigsaw puzzle made by Educa (reference 15193). Size: 68 x 48 cm (= 26.8 x 18.9 inch). A jigsaw puzzle made by Educa and available to buy here at Babylon Puzzles. It's known at Educa with reference number 15193. 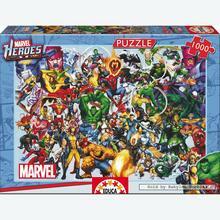 Official name is "Marvel Heroes". It consists of 1000 pieces and weighs 980 grams in the box. Once assembled this puzzle measures 68 x 48 cm (= 26.8 x 18.9 inch). * Click here for more items in the special series Marvel. Educa puzzles are made in Barcelona, Spain and are considered to be the best quality puzzles available today. 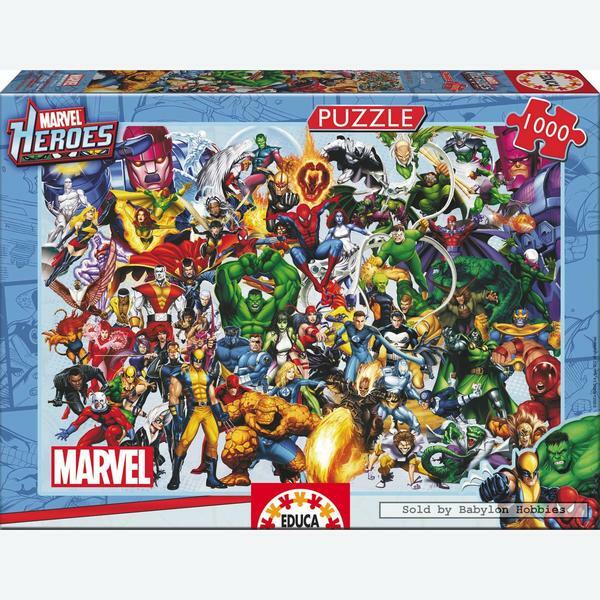 Their puzzles are made using the best quality boards that ensure a perfect fit between puzzle pieces without puzzle dust. Tens of thousands of customers have taken advantage of Educa's "Lost Puzzle Piece Guarantee" which replaces any lost puzzle piece directly to the customer.